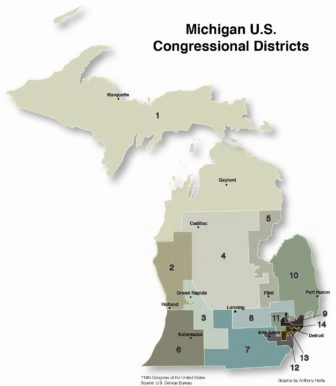 Incumbent Mike Bishop, R-Rochester Hills, appears to be on track to be re-elected to represent Michigan’s 8th Congressional District. With 75 percent of precincts reporting, Bishop leads Democrat Suzanna Shkreli 58 percent to 37 percent. The district includes Livingston, Ingham and sections of Oakland County. The battleground is traditionally a Republican district, although not overwhelmingly so, said political analyst Bill Ballenger, a former Republican state lawmaker. He pins the area at roughly 54 percent Republican. Actress Melissa Gilbert had been set to challenge Bishop for the Democrats. Gilbert withdrew in May, saying she was “physically unfit” because of complications from head and neck injuries. There was a lot of controversy over whether she could be replaced, Ballenger said. “The Democrats had a lot of trouble putting together a candidate this year,” he said. In Gilbert’s place emerged Suzanna Shkreli, a Macomb County assistant prosecutor who served in the Child Protection Unit. She has never run for elected office. Part of her campaign strategy was to criticize Bishop’s support of Republican presidential candidate Donald Trump. She also took a firm stance against the Trans-Pacific Partnership. Despite Shkreli’s late start, less than a month ago one poll showed her trailing Bishop by fewer than 4 percentage points, Ballenger said. However, recent polls showed support for Bishop 19 points higher than Shkreli. According to the Michigan Secretary of State, Bishop captured 54.6 percent of the vote in his 2014 congressional race, defeating then opponent Eric Schertzing by 12.5 points. Mitt Romney won the district by 3 percentage points in 2012. Bishop was a state senator from 2002-2010. At the start of his second term as a state senator, Bishop was chosen to be the Senate majority leader, Michigan’s first from Oakland County. His campaign website boasts positions that are “conservative to the core.” He plans to fight for legislation to cut the budget, lower taxes, protect gun rights and fight abortion in Congress. Shkreli campaigned on standing up to the tough issues, such as “multinational corporations that are rigging the system against the middle class,” as her website proclaims. She also aimed to create good jobs in Michigan, improve schools, protect Social Security and Medicare, care for veterans and to fight for women in Congress. In 2016, I earned my Bachelor of Arts degree in Political Science and Constitutional Democracy from the James Madison College at Michigan State University. I expect to earn my Master of Arts degree in Journalism in Spring 2017. My future aspirations include attending law school to become a corporate attorney. Eli Pales is a political science and journalism major graduating in 2019. Eli is from Aurora, Colorado, and enjoys talking about current events and political issues. In his free time, Eli enjoys running and writing about video games. In buildings across Michigan State University’s campus, hundreds of students stood in lines that wound around buildings. The wait to vote was sometimes longer than two hours. One thing was clear: passion drove students to fill campus polling locations.